This year’s Worldcon was held in the Spokane Convention Center and numerous hotels surrounding it. The convention center was clean, well-maintained, accessible, and had sufficient restrooms and food locations. Food was pricey as it is in all convention centers, but the convention had a con suite in an adjacent hotel and in the evenings there were parties in a hotel several blocks away. There were also some restaurants just a block or two away which were very reasonably priced. The convention center parking was reasonable but there was not enough of it so many had to use the lot across the street which was $15.00 a day. None of the convention hotels were of a price level most fans can afford for a five day stay. It was possible to find cheaper hotels in the area, but most of them were run down and in bad repair. In fact, many parts of Spokane away from the convention center could be described as old and run down in comparison to similar areas in Seattle and Portland. 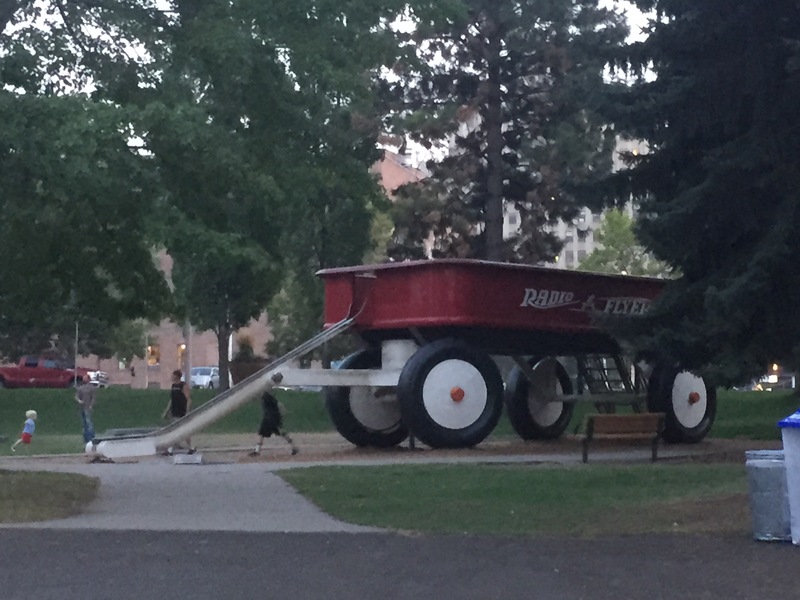 Spokane has a very nice park with an antique carousel and a giant red Radio Flyer wagon with a slide for a wagon tongue. The Spokane Falls are at the back of the park and there was a ski-lift type ride which took you out over the falls. Unfortunately due to the fires in the surrounding areas the air quality was very bad and there were health alerts which warned everyone to stay inside, so the parks and outdoor eating places could not be enjoyed. Plus it was exceptionally hot, often above 85 °F, so being outside was a nasty chore, not something pleasant. This made the parking situation worse because you choked half to death while walking to your car. Due to the health alerts there should have been better provisions for people with breathing difficulties who do not normally need a Disabled placard. Once you got past the health issues the convention was generally well-run. Panels started and finished on time, registration and sign-ins for number-restricted events were well-organized, the dealer room was well laid out, and there was room to sit down at tables or sofas. Panel organizers appeared to try to bring diverse authors onto panels but like many conventions could really have used some oversight from a diversity coordinator. Many “diverse” authors were on panels with topics which had nothing to do with the type of writing they do. It looked as if someone said, “Oh, we need diversity on this panel so let’s randomly pick a diverse author we used somewhere else instead of broadening our panelist pool and finding a diverse author who fits the topic”. 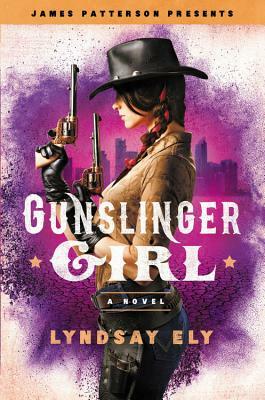 Also “diverse” authors need to be put on panels about the subgenres they write about not just on generic panels. What happened to panels on editing? There were numerous editors and publishers in attendance but the only programming they appeared on was the panels promoting their upcoming releases. 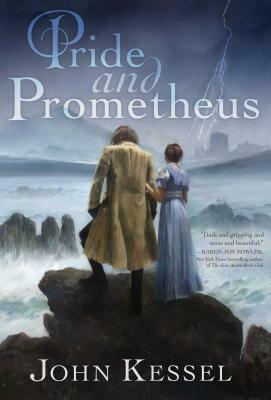 With so many writers there it would have been helpful to have some panels that included editors and addressed topics such as query letters, pitches, editing your own work, ways to improve your submissions, whether submissions are better agented or non-agented, and so on, but this was left off the program entirely. 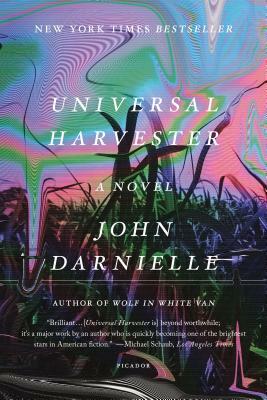 Your Humble Reviewers had entire mornings and afternoons when the only things we attended were events with limited numbers to speak to one author or editor; while these were useful, the lack of informative panels was frustrating. Also, many of the women authors we wanted to see had only one or two panels the entire weekend and it seemed that many of the panels they were on had topics which made no sense. 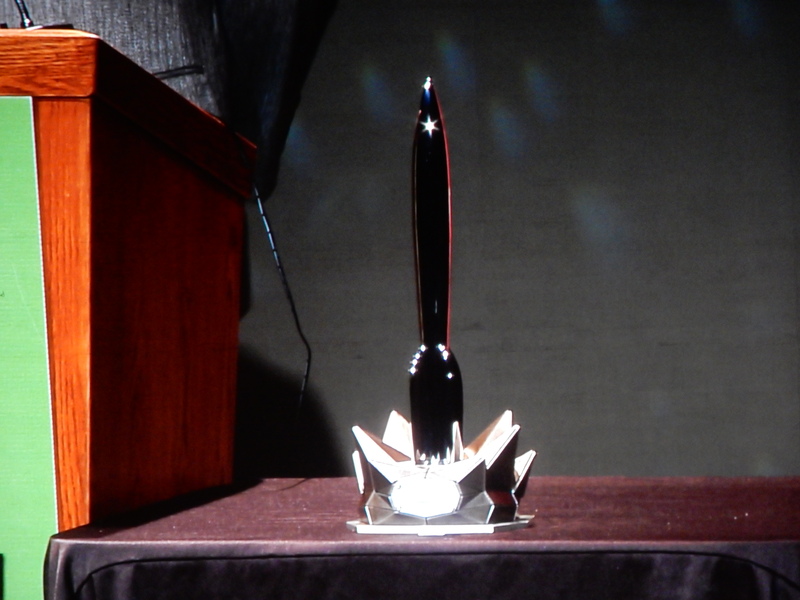 The Hugo (picture of statue above) awards on Saturday night were the highlight of the weekend. 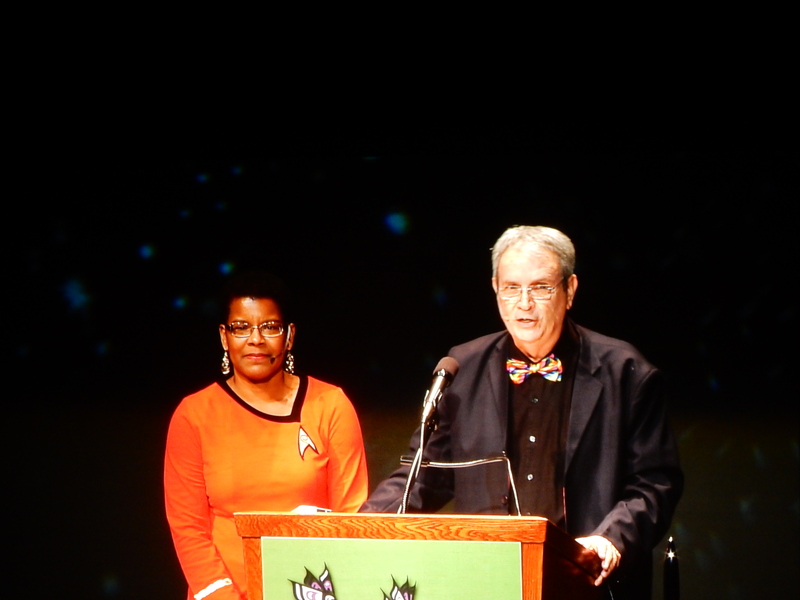 The hosts, David Gerrold and Tananarive Due (pictured above), did an excellent job of trying to make light of the craziness leading up to this year’s awards as well as keeping a lid on the rudeness of some ill-mannered audience members. 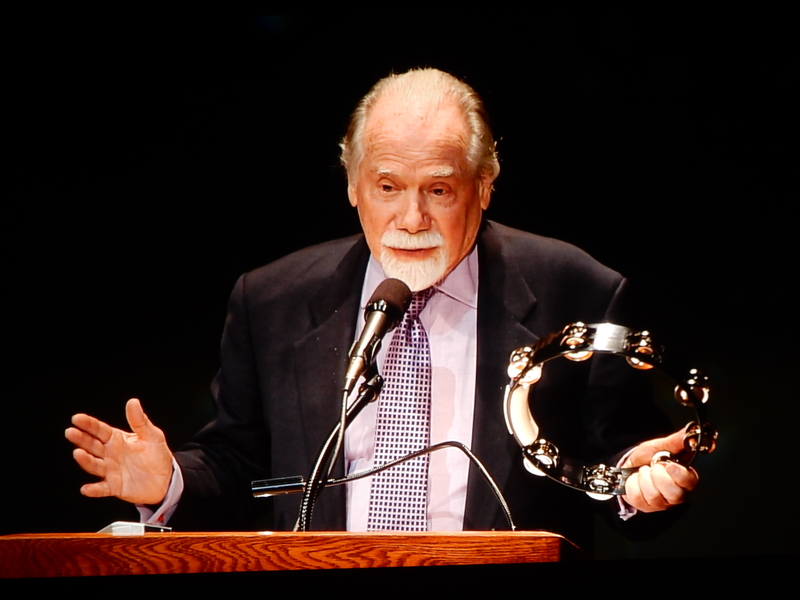 We got to hear from some revered elder statespeople of the genre, Robert Silverberg (in picture below) and Connie Willis. 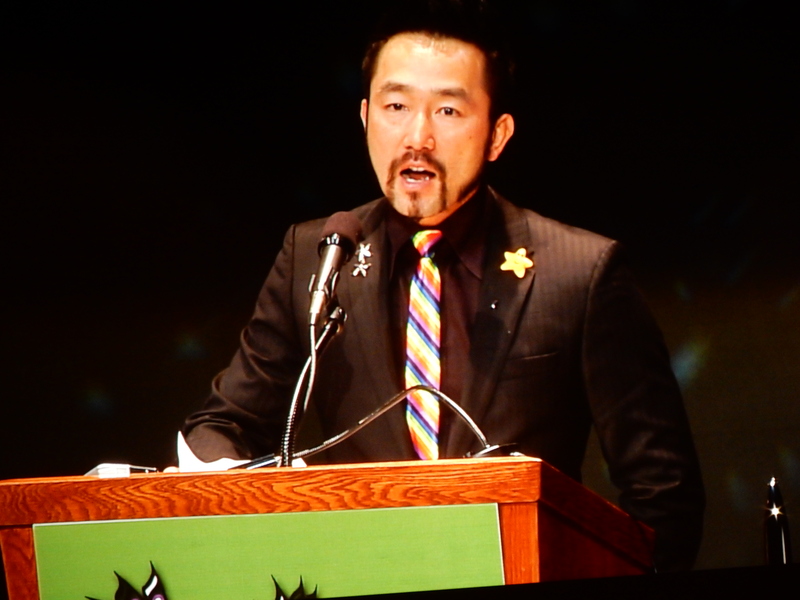 Our favorite speech was by the extremely funny winner of the John W. Campbell award, Wesley Chu (photo below). All of the recipients in highly contested categories comported themselves with dignity with some audience members being the only ones who said or did something inappropriate. Nothing got out of hand, though, and the ceremony went off without any disruption, much to our relief. 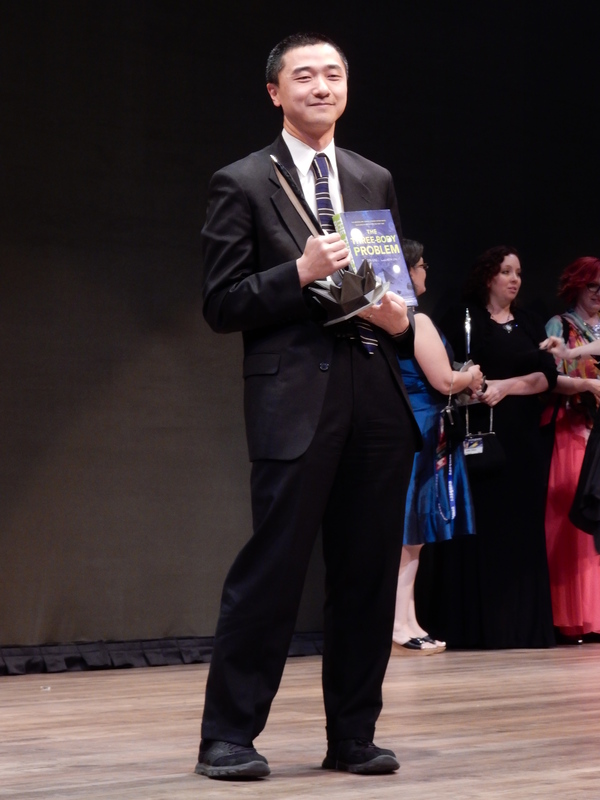 Some interesting facts: the Campbell award went to a writer who didn’t speak English until he was school age and The Three-Body Problem, written by Cixin Liu and translated by Ken Liu (pictured with the Hugo and book below), was the first translated work to ever win the award for best novel.